Tetris download. 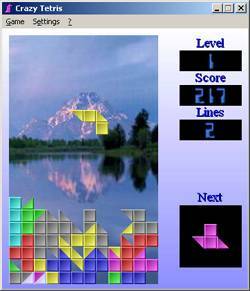 Download tetris game. Crazy Tetris download. Crazy Tetris is unusual clone of the immortal Tetris game. In this Tetris game blocks consist not only of squares, but of triangles too. Types of game are listed from simplest to hardest. Even small kids can play in the Simple Tetris mode, but playing Mutatix and Crazy is for extreme Tetris players in general. You will find friendly interface, nice sounds, music, large High scores table and World Records Table in this Tetris game. Also before writing your name to High Scores you can choose a pleased face from the list of more than 200 funny faces. The goal of the Tetris game is to maximize your score by placing the falling blocks or triangles into lines. Every assembled line that has disappeared increases your score. If you are a Tetris fan, you should download Crazy Tetris! 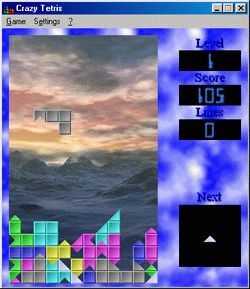 Download Tetris and enjoy! Tetris is a really good game for having some rest after work! Crazy Tetris game supports multilingual interface. Supported Languages: Bulgarian, Catalan, Chinese, Dutch, English, French, German, Hungarian, Portuguese (Brazilian), Russian, Spanish, Swedish, Turkish, Ukrainian.